I think this is one of the more beautifully worded dedication to The Craft spells I have ever read. Even though it says it is for s Solitary Witch it could be used in a coven setting also. Cleanse the space and cast the circle. “I call upon the spirits of the North, that they join my Circle and bring word of the dead, and take my words to them! Welcome, spirits of Air! I call upon the spirits of the East, that they join my Circle and bring the comfort of the Earth, the flesh of the Mother, to which we all return. Welcome spirits of Earth! I call upon the spirits of the South, that they join my Circle, bringing purification, that my soul learns from the trials and joys of life. Welcome, spirits of Fire! Posted on April 25, 2015 by ladyoftheabyssPosted in Ritual Working, The SabbatsTagged Black Candle, Bread, God candle, HAllowee, my Circle, Natural bowl, Pagan, Samhain, Solitary Ritual, solitary Witch, Wicca, Witchcraft. What A Glorious Tuesday Morn’ The Goddess Has Blessed Us With! Posted on April 21, 2015 by ladyoftheabyssPosted in Articles, Daily PostsTagged solitary Witch. Being a solitary Witch does not mean that you have to do everything alone. I myself have been a member of a coven and practiced on my own as well, finding that not everyone is meant to perform rituals and works of magic with others. Sure, sometimes it is nice to be joined with others of your own faith. But being a part of a coven is not for everyone. I found my path about ten years ago. A friend in high school introduced paganism to me. Mind you, this was also during a time when the movie “The Craft” had already gained cult status and being a witch became somewhat of a trend. My sister and a friend of ours also became interested and we dedicated ourselves as a coven before I knew it. For a few weeks the four of us were so close that we enjoyed practicing meditations, working with our energies, and celebrating midsummer nearly every day. Things seemed so great; I had finally found my calling and felt that the world was at peace with itself. Unfortunately that would not last long. Our high priestess, my friend who introduced this faith to me, had her own agenda. That’s not to say that she meant any harm, and I will always be connected to her through the bonds of friendship. But the power this young high priestess felt over the rest of my coven mates and me seemed to overcome her better judgment. She began playing us against each other, praising me for my strength with the elements, only to use that as a way to make one of the other coven mates feel powerless. Then this same high priestess would turn around and favor my sister in a way that brought me down. It wasn’t long before the three of us realized what was happening. So instead of turning against each other, we started distancing ourselves from our leader. The coven was eventually disbanded; we were young and had much to learn. It was a true experience, but since then I have not felt the need to join another coven. Nor do I think that I will ever want to again. Our high priestess has, to my knowledge, stopped practicing altogether, along with our other friend who has completely withdrawn from her beliefs. 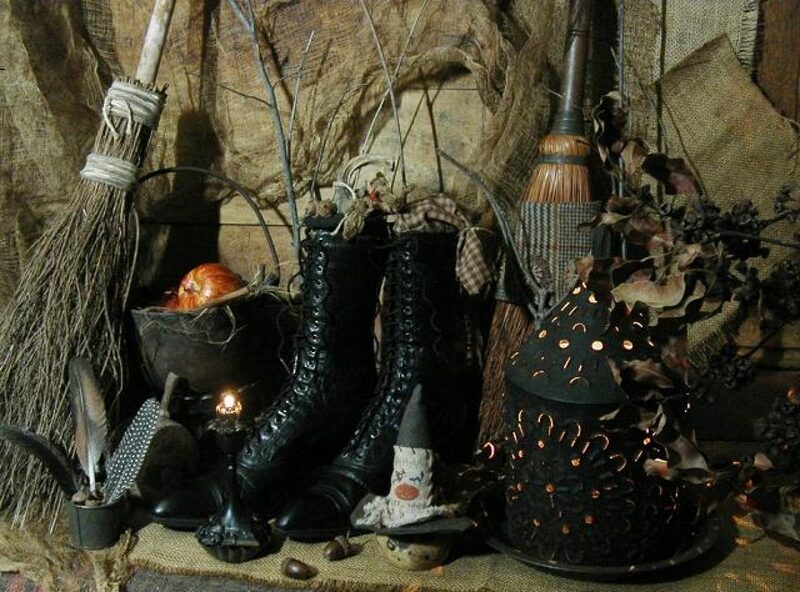 My sister and I witnessed quite a few people go through the fad of enjoying the ‘benefits’ of becoming a Witch, and when they realized that there is so much more to Paganism than just doing spell work and wearing the color black, they moved on. But Wicca was so much more to me, as it has been for many others. I became enamored with its teachings, and immersed myself in as many books, articles, and shops that I could find. My sister has always been very encouraging and still holds her beliefs, but she is not as active in her faith as she used to be. We have sometimes celebrated the Sabbaths together, but I was often on my own. Luckily, the years have been kind to me. My connection to the Gods has only grown stronger as I have worked very hard to maintain a balance between living a healthy natural life and finding my place in society. A challenging task at times, but I always say that this is the best time to be a witch. I am now married with a daughter of my own, and though I still consider myself a solitary witch, the wheel of the year is quite a beacon of light in our home. Celebrating the holidays reminds me that love is the main ingredient in any faith. And the Gods sure have graced my family with plenty of love. We highly enjoy our festivities with our shy lion head rabbit Penny, our scaly fish Einstein, our two fluffy cats, Smokey and Tortoro, as well as our sweet dog Willow. I feel more at ease performing ritual with my family, including these beautiful creatures, than I ever did in a coven. Some days I enjoy my meditations and rituals alone, whereas there are others where my husband and daughter join in. We are linked through our beliefs like many people, but my husband is a Taoist so his participation is based more on ideals than ritual. Not being a part of a coven has had a very positive effect on me. I have the freedom to focus on my own journey, while not feeling too self-centered. I take my faith very seriously while trying to know how to loosen up and enjoy my beliefs. Finding many solitary guides has made this possible. There is a multitude of books, magazines, and online sources that give me the information I need as well as offering a sense a community. Being lonely is not part of being a solitary witch because true Pagans are very personable. There is nothing more I love to do than speak with others about faith, as long as I am speaking with someone who is respectful. I live to enjoy life, knowing that the gods are always around me. If I do feel the need for a little Witchy interaction from time to time, there is always the “Pagan Picnic”, classes I can take at my New Age Shop and “the Witches Ball”. Our annual Renaissance Festival has quite a few Pagan elements included as well. Having the opportunity to attend these events allows me to be social enough with other people of my own faith without having to worry about the demands of being part of a coven. Some Wiccans prefer those coven/group bonds, and that is understandable. Words cannot express the kind of link that one has to the other members of their coven. But many of us are perfectly happy to have the freedom of practicing our beliefs on our own. After all, everyone has their own path to take and being a solitary Witch is full of freedom, happiness, and adventure. Posted on February 17, 2014 by ladyoftheabyssPosted in Articles, Daily PostsTagged Coven, Craft, High priest, high priestess, Pagan, Religion and Spirituality, solitary Witch, Wicca, Witch, Witchcraft. Posted on January 3, 2014 by ladyoftheabyssPosted in Articles, Daily PostsTagged high priestess, solitary Witch. Some Witches practice alone— in solitary— rather than with a group. Perhaps no coven is available, or a Witch may prefer to follow solitary practice because it suits her particular purposes, temperament, or lifestyle. Some people may work alone for a period, then join a coven for a period. Witches who don’t belong to a coven may still gather with “kindred spirits” to celebrate the sabbats or other events, in a sort of extended Circle. For seasoned Witches, a solitary path may be simply a choice. For the beginner, however, working alone can be lonely. It can also be more difficult than being guided by other, more experienced colleagues. On the other hand, a solitary pursuit enables you to develop your own style of magickal expression, rather than taking on the ideology or outward form of an established group. Fortunately, today many books— including this one— exist to teach a novice the basics of Wicca and Witchcraft. Read lots of books by different authors, to gain a variety of insights and perspectives. Meditate regularly to improve your mental focus and your connection with your higher self. Set a schedule for yourself that makes magickal study and work part of your everyday life. Apply what you learn— study alone won’t make you a Witch. Start with simple rituals and spells, then work up to more complicated ones. Don’t get discouraged if something doesn’t work out the way you’d planned; try to determine what went wrong and why, and learn from your mistakes. Practice, practice, practice— magick is like every other skill: The more you do it, the better you get. Keep a journal (Book of Shadows) of your experiences. Posted on October 17, 2013 by ladyoftheabyssPosted in Articles, Daily Posts, Wicca, WitchcraftTagged Book of Shadows, Coven, Magick, Solitary Practice, solitary pursuit, solitary Witch, Solitary Witch: The Ultimate Book of Shadows for the New Generation, Wicca, Witch, Witchcraft, Witches.